Trail magic – lending support to long-distance PCT hikers – is a practice that’s been on the rise. It has many forms: a ride into town; a cold soda at the trailhead; a shower and a bunk. Many people consider these to be remarkable acts of kindness and a positive influence on the trail experience. However, a certain form of trail magic is inadvertently impacting the PCT and our community. 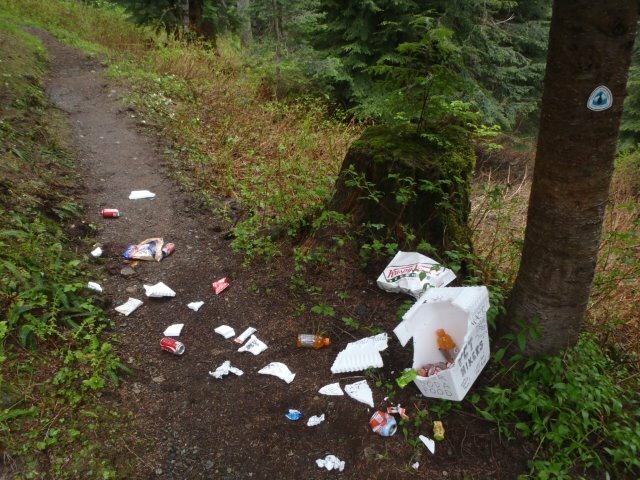 When left unattended, food and beverages stashed beside the trail create a litter problem and introduce wildlife to human food. These caches often become eyesores as trash collects and is strewn about by animals, wind, and people. They are often illegal on public land and limited resources are wasted removing them. By contrast, refreshments offered in person to long-distance travelers may be more easily contained and cleaned up. A (staged) example of what not to do. Please offer snacks and drinks in person. The PCTA and our trail management partners do not endorse the practice of leaving unattended caches of food and beverages along the PCT. When considering appropriate forms of trail magic, please recall Leave No Trace principles, including being considerate to other visitors, respecting wildlife, and disposing of waste properly. Offer trail magic in person. Leave nothing behind on the trail. Trail magic is more than just a cooler full of food. Consider committing acts of kindness beyond leaving unattended food on the trail. Please read more in our guidance about trail magic and for trail angels. Water caches, especially in very dry stretches of the PCT, are a separate and more complex matter. Please read our essay about water caches.